Anthony Davis battled against the decision, but team physicians were convinced his back injury will require 1-2 weeks of rest and rehabilitation in order to heal. The New Orleans Pelicans skimpy roster is now even thinner after management decided to shut down Anthony Davis and Eric Gordon for the team’s remaining four games. Davis battled against the decision, but team physicians were convinced his back injury will require 1-2 weeks of rest and rehabilitation in order to heal. The 21-year-old All Star has been powering through painful back spasms, even using Dry Needling, which is similar to acupuncture, to try and release enough pain to get him through a game. The last matchup Davis participated in was Sunday in Portland. His back spasms were so severe that he couldn’t sit upright on the bench when he came out of the game to rest. Instead, Davis stretched out on the floor at his teammates’ feet, trying to calm the spasms. Head Coach Monty Williams forced Davis to sit out of Wednesday’s matchup in New Orleans with the Phoenix Suns. The team announced the decision to hold Davis out for the rest of the season Thursday. Gordon is already scheduled for arthroscopic surgery on his left knee next week. 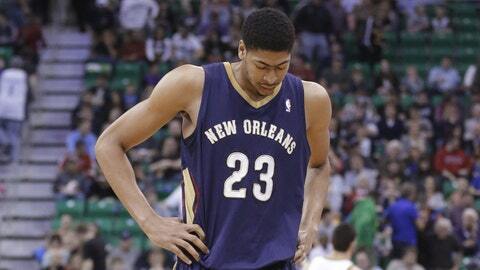 He’s missed the Pelicans’ last ten games because of tendinitis. In 67 games (66 starts) this season, Davis has averaged 20.8 points, 10.0 rebounds and 2.8 blocks in 35.2 minutes per game.